Every dark lord needs his cannon fodder - someone to throw into the gaping jaws of death in order to fatigue, delay, or otherwise annoy his foes. Sauron has his orcs, Darth Vader has his Stormtroopers, Ozzy Osbourne has his immediate family. Darkseid, Jack Kirby's amalgam of Richard Nixon and Jack Palance who now serves as the DC Universe's darkest lord, has his Parademons. Of the many warriors serving Darkseid, lord and absolute master of the planet Apokolips, none are more feared or loyal than the Parademons. Artificially grown in the genetic laboratories of Apokolops, these elite soldiers prowl the dark skies of Armagetto dealing death and destruction to all who challenge or invader their master's domain. Their every waking moment, every thought, is filled with one purpose only: to protect and serve Darkseid - at any cost! What are Parademons? Even after reading a good amount of New Gods comics, I'm not quite sure. I don't think Kirby himself ever really got into their background much. The prefix "para-" suggests they've not quite graduated to being full demons. On the other hand, given Darkseid's obsession with Anti-Life, perhaps Parademons are simply the Apokoliptian equivalent of paramedics - they try to kill you rather than save you. Or, more logically, it's possibly meant as a play on "paratroopers," which Kirby would have been familiar with from his time in the army during WWII. 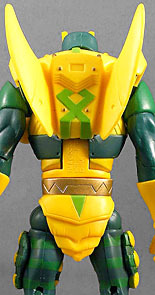 In the original New Gods comics, Parademons were depicted as ugly gray-skinned humanoids in green-and-yellow outfits; they didn't look anything like the classic Western conception of a demon. 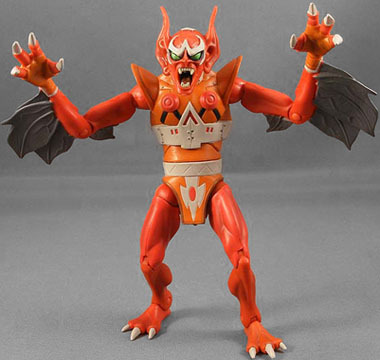 When Kenner and DC created the Super Powers toyline in the 1980s, they paid Kirby to redesign some of his characters (most notably the Parademon and Mantis) - possibly just so he could be paid royalties for his work. 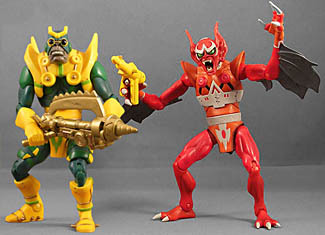 Oddly enough, Kirby's redesign of Mantis ended up looking much like the original Parademon, while his new Parademon looked a lot more like the classic pitchfork-bearing devil. 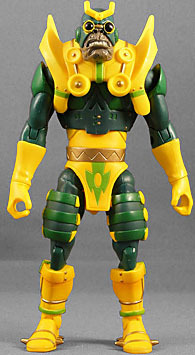 Aside from the odd appearance in a DC comic (Parademons are almost always depicted based on Kirby's original green version), the only media this version of the Parademon appeared in was the final season of the Superfriends cartoon. The Green Parademon is based on the original Parademons in Kirby's comics. In their green-and-yellow outfits and large numbers, they strongly resemble the shock troopers of Marvel's Hydra, who first appeared in Strange Tales #135 in 1965 and were created and designed by, yes, Jack Kirby. Kirby's Parademons were created a good six years after he designed the Hydra goons. The two share similar roles in their respective organizations and share the same fashion sense when it comes to colors and goggles. But then, Kirby wasn't above cribbing from previous designs on occasion - see Blastaar (Marvel, 1967) and Kalibak (DC, 1971). One wonders whether Kirby simply wanted the opportunity to use the characters he'd created his own way, rather than letting another writer develop them. Even Kirby himself didn't draw the Parademons in any consistent fashion, and artists since then have followed suit. There are certain parts of the outfit that need to be there - the gray skin, the v-shaped antennae, the outfit colors, the goggles, the small curved yellow wings - but everything else is fair game for artistic license. The Four Horsemen have done justice to Kirby's design while adding some nice little touches of their own. The green Parademon has one of my favorite head sculpts in DCU thus far. The outfit is nicely detailed while paying homage to Kirby's unique style. The sculpt also works in an excellent hunchbacked posture that works well for these twisted henchmen. The red Parademon features a ton of fantastic brand-new sculpting. The only part only major part that's been re-used is the torso - and that's only shared with the normal version! He's a very close approximation of the Super Powers figure - the only difference I can see is the Horsemen's version only has four fingers to the original's five. But with the benefit of more than 20 years of action figure development, he's far more menacing and detailed than his predecessor. 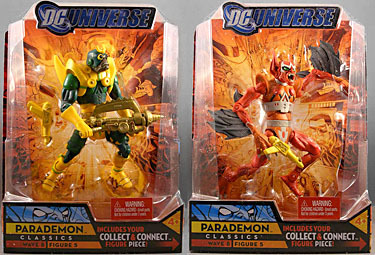 Given the bright design, it's inevitable that the Parademons ended up looking more toy-ish than other DCU figures. This doesn't bother me, though, for two reasons. First, as I've made clear before, a toy-ish look generally doesn't bother me, but I realize it bothers other folks - so your mileage may vary. Second, Kirby's bright, colorful designs almost looked like toys in the first place. But don't overlook the multitude of smaller paint apps here, though. There's some sharp detail work around the face, especially in the wrinkles around the exposed flesh. The highlights on the upper armor and legs are clean and neat. Given their monstrous nature, the Horsemen apparently decided they didn't need to worry as much about preserving the integrity of the sculpt when it came to giving the Parademons hip articulation (which makes sense to me). So the Parademons have the first exposed balljointed hips we've seen in DCSH/DCU (certain skirted figures, such as Darkseid and Supergirl, have had balljointed hips). 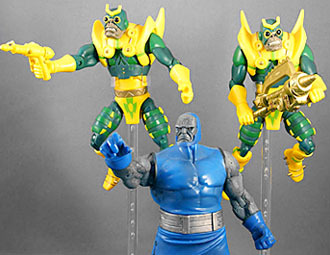 The joints are identical to those found on MotU Classics figures - you know, the kind Marvel Legends used seven years ago. Unfortunately, the Parademon's head is not balljointed. This may be because the peg is too small (meaning a ball would be too risky in terms of breakage) or because it was designed to accommodate a large piece of armor over his shoulders. Either way, it's definitely a disappointment on an otherwise great figure. The Parademons also have the following joints: balljointed shoulders (which are smaller and more maneuverable than usual), hinges at the elbows, knees, ankles and abdomen, and swivels at the waist and wrists. However, the green one doesn't have the usual bicep swivels, due to the unique sculpting of the upper arms and the smaller, more maneuverable shoulder joints, which almost - but don't quite - make up for the lack of biceps swivels. Red is more traditional. The Parademons both come with a yellow blaster. The blaster is based both on the original Super Powers weapon and a Jack Kirby pin-up of Kalibak, which features a similar blaster on Kalibak's belt. Accordingly the blaster can be attached to Kalibak's belt by a peg on the side. The green Parademon also comes with this blaster, in addition to the golden rifle (one of the coolest Easter eggs we've ever seen). 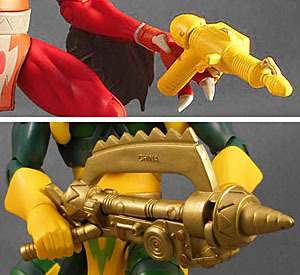 Since the red Parademon's hand is sculpted in an open position, he can only hold the blaster by fitting the handguard over his right hand claws. It's designed to do this, so theoretically there shouldn't be any problem. But here's the thing: because the blaster was placed in the figure's hand in the package, the blaster came out warped, and the handguard that is meant to clasp to the fingers is stretched away from the blaster. This makes it hang loosely in the figure's hand (or not at all). On the other hand, the yellow blasters that came with my green Parademons were in their own part of the blister (the figure is holding the golden rifle), and so they have very tight handguards - which is a problem, since the green Parademons' hands aren't designed for it. Amusingly, the warped blasters that came with the red Parademons fit much better. Long story short, a quick swap and all four of my Parademons had yellow blasters they could hold easily. But if you're only getting one version or the other - particularly just red ones, who don't have any other weapons - I can see this being very annoying. So please, Mattel: stop putting accessories in figures' hands in-package. Oh, and they also come with Giganta's left arm. It's merely the opposite of what came with Doctor Fate, so I hope you'll pardon me if I refer you to that article if you haven't read it already. I could copy and paste the same information, but then I'd just look even lazier. Since the Four Horsemen and the designers and brand managers at Mattel are such fans of the original Super Powers line - and Kirby - it's no surprise we got both the classic green Parademon as well as this one. They're available in equal 50/50 case ratios, although the comic-accurate green version is more popular with collectors. Some DCU8 figures have loose joints, and the green Parademon's legs may be the loosest. But I could hardly care about it when compared to sloppy paint applications, breakage, stuck joints, swapped or repeated limbs and so forth that used to plague this line. A slight wobble is nearly nothing. For those of you who have been so angered by the bad QC on DCUC, Series 8 represents a major step forward. I didn't have one problem with breakage, stuck joints, or swapped limbs. Mattel has heard your complaints (which were certainly fair - I've never claimed otherwise) and has worked to improve them, and they deserve some credit for that. This is a fantastic, fun action figure. They both are. They're army builders, and judging from collector response, already a very popular one. I picked up four myself, and I won't discount the idea of getting more if I ever see them at retail. The clever inclusion of Kalibak's SP Beta Club and the extra pistol net Greenie an extra point. The Parademon is one of the best examples of a DCU figure yet.